I have just put the finishing touches on the v0.75.0 update to My Colony, and will begin pushing it out to all platforms tomorrow (Thursday) morning, possibly even tonight if I get time. This is a huge update in terms of "under the hood" changes, and so there is a lot to cover here. It also marks the beginning of a series of "online" focused updates which will be taking place between now and the end of the year. Now that My Colony has arrived on Steam (which you can find here), I have decided to shift focus a bit more away from the mobile side of things, towards the Desktop and online side of things. My Colony has always played better on the Desktop, but since the majority of users were on mobile, a lot of the design of the game had to be made with that reality in mind. As some of you already know, a few months ago, Google Play blacklisted My Colony from their store search results, cratering the mobile downloads of the game by over 90%. As a result, the My Colony user base has transformed from over 90% mobile users, to now almost 50/50 with Desktop users, spread out between my website, the Ape Apps Launcher, Windows 10, Chrome OS, Facebook Games, and now Steam. And even though the crash ratings on Google Play are back down under 2% and the downloads have picked back up slightly, it is still nowhere near where it once was. On top of that, the experience did open my eyes as to how Google Play operates, and demonstrated the risk involved with being tied so heavily to one platform. On Desktop, things are spread fairly evenly between the distribution networks (too early to tell on Steam yet), so there is a little bit of safety that comes with that situation. Plus, as I said, the game is just 10 times better on Desktop anyway. So, just to be clear, I am not abandoning Android and iOS, and those platforms will continue to receive all of the latest updates. I am just not going to be focused on mobile first, and some features may not work on mobile platforms, as you will soon see below. But enough of the intro, you are here to see what is new in this version, and there is quite a bit. So let's take a look! First I want to go through some of the bugs that were addressed in this release, as one of them has a pretty large impact on later-stage Human colonies. So during this update, I discovered a mistake in the code that was majorly"nerfing" building consumption and production when the building had a very low "tick" phase. The two prime examples where the Ancient Alien Condenser and the Atmosphere Scrubber, but it would also impact buildings with tons of employees, like the Investment Bank. Essentially, if the production/consumption tick phase was lower than that of the overall simulation's building tick phase, a bunch of update cycles for that building would get skipped, causing it to produce or consume resources at a far slower rate than it was supposed to. As far as I can tell, this issue has been baked into the game for ages, and when adding new content, I have just set the stats in a way to compensate for it, not even realizing it was there. As soon as I fixed the glitch though, the impact on Atmosphere was immediately apparent. Ancient Alien Condensers and the Atmosphere Scrubber immediately went into "beast mode", chewing through millions of atmosphere in a matter of minutes. This brought my Atmosphere down to zero, causing all of the condensers in the colony to shut down, since they were out of "fuel". This led to an immediate water shortage which was difficult to get on top of, since I could not generate new atmosphere fast enough to keep up with the consumption of the condensers. I eventually just had to import a ton of water from the Star Gate. Anyway, to address this, I slightly nerfed the stats on the Condenser, and introduced a new upgraded Large Atmosphere Generator to assist in rebuilding Atmosphere. I kept the Scrubbers running in beast mode though, I figured at their new consumption level, one Atmosphere Scrubber can take care of a pretty good sized colony. So be aware of this new change, and modify your colony accordingly. I already know the bug reports section will be full of "I updated and now all of my Water is gone" reports, so just be aware of what is happening. It is not exactly a bug, but the result of the fix of a bug. The next fix is related to Creative Mode in Region games. Basically, it didn't work before, and now it should. Speaking of Regions, there was a glitch where Resource decay would be greatly amplified on Region maps. This has been corrected. I have also implemented several changes which I hope address the issue people have on Regions where tech/resources are lost. I cannot reproduce this issue on my own, so I hope the fix works. I know you will make me aware if it doesn't though! Next, a lot of changes were made to the server this update. I am getting ready to add in-game moderators to My Colony, which I had hoped to have ready by now, but the server needed so many changes to accommodate for it, that I just didn't get to it. Just know that it is coming soon though. The first big change comes with authenticated API calls. Aside from the public API's, you basically need to be logged in to your Ape Apps account to do anything on the server now. This requirement seems like a no brainer, but you have to realize that the My Colony server predates the Ape Apps Account server, and there were originally no account requirements at all. Due to this change, the tie between your Ape Apps Account, your online colony, and the website is now pretty solid. If you happen to get banned from Ape Apps for some unrelated reason, your colony is pretty much inaccessible too, and you will need to send me an email convincing me why you should be able to get back in. All colony resources are now stored on the server as well. They have actually been stored on the server for some time, but the server would never override the resources saved to your game file. Now it will. The server now keeps a timestamp and checksum synchronized to your online game saves, so that it can detect if you have decided to go back and restore a backup game file. This is to help detect different forms of cheating that are out there, and while restoring a backup does not flag you as a cheater, it is logged and will be available for review by the soon-to-be-announced in-game moderators. Next up, in-game private messaging has been moved from the my-colony.com servers to the main ape-apps.com servers. As a result, you can now view and reply to your in-game private messages from right here on ape-apps.com. They will also soon be available on my-colony.com. Currently, they don't render very well on the website, but I will be making it all look pretty shortly. In-game it doesn't look much different from before, but in theory the message size limit is gone, although the game still doesn't let you write more characters. The website does though. In the coming updates though, the entire in-game messaging interface will be rewritten to take advantage of the new features available by using ape-apps.com messaging. The next big change in the game, which I have mentioned already in another thread and some may not be pleased with, is the complete rewrite of how colonial GDP is calculated. In short, it is now an actual GDP calculation, instead of just the sum of all of your resources. So now instead of measuring just how rich you are, which anybody can attain by simply getting a big gift from another colony or from the Galactic Emperor, it is now a measure of the current productive output of all of your buildings, tax collections, and resource collections. In this way, your GDP only grows if your industrial output is growing. If you are maxed out with full storage, then your GDP will be stagnant. I might adjust it next update to have GBT profits figured into the calculation as well, since it is technically a sale of goods. I haven't decided yet. The game tracks your GDP over time, and will give you both quarterly and annual prints. It takes about two hours of game time to collect enough data to get a full GDP reading, so be aware of that. In your stats, the large GDP number is your current quarterly rate, and the smaller number is the annual rate. One game "year" is roughly equivalent to one real life hour. The quarterly and annual growth percentages also factor GBT price inflation into their calculations, so that large fluctuations in GBT prices do not throw the GDP growth values way off. 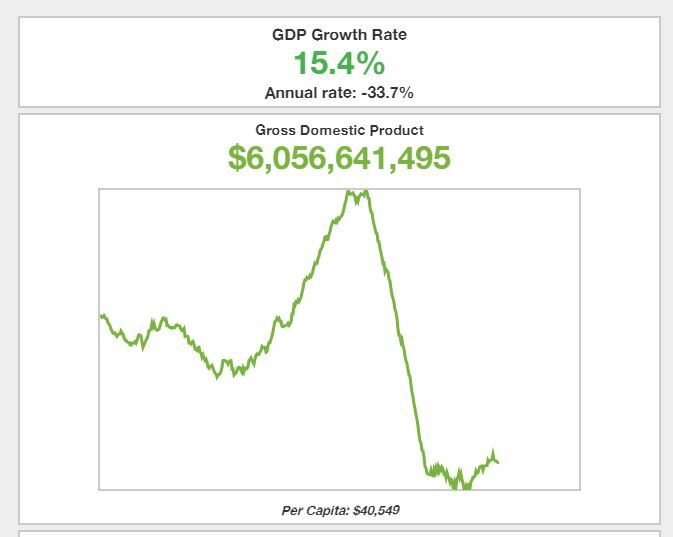 In addition, the game ai now has "economic analysts" who will try to guess what your GDP growth rate should be every quarter, based on the trends of the last year, and will let you know each quarter if you were on target or below estimates. It's sort of like watching CNBC. I might start adding other fun little news items to the GBT price ticker on the bottom of the screen too. Next, there is a new feature that I hope people are able to have some fun with. I have added the ability in-game to stream a live feed of your game play onto your colony website at my-colony.com. On supported platforms, there will now be a "Streaming" button in the bottom right corner of the screen. When you click on it, it will start up your live feed and turn Red, letting you know that it is on. It also uses your microphone (if available and you give it permission) so that people watching your stream can hear your amazing voice-over commentary. Also when you turn on streaming, the in-game chat channel and the chat channel on your my-colony.com colony site are synchronized, so that you can text-chat directly with those viewing your feed. You will also get a notification in-game when somebody starts watching your live feed. The in-game streaming works if you are playing on Chrome, Android, Native Client/Steam. It does not currently work on iOS or Windows 10 (Store) edition of the game. I am not sure about Facebook Game Center, as I did not test it. 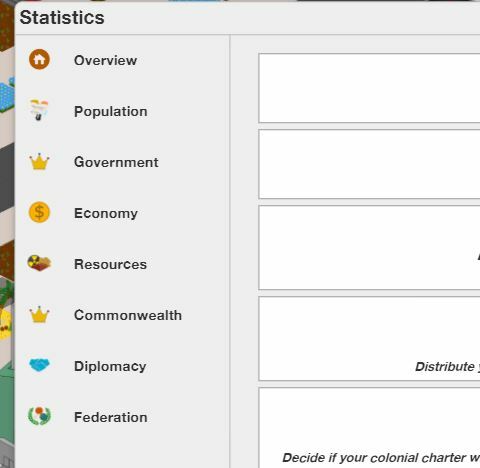 Moving on, I have decided to merge the in-game popup Commonwealth and Diplomacy windows into the main Statistics window, so that everything is in one place. In-game private messaging will also be moving to this window soon, and eventually, a revamped in-game encyclopedia will be in there as well. I just think it's better to have all of the options in one tidy place. You may have also noticed a new "Federation" option at the bottom. Federations are headed in-game to My Colony. I have been promising them for a year and a half now, and since I decided to focus on online play for the next couple of months, Federations went ahead and made the cut. Creating or joining a Federation requires "government level 7", which is game-engine speak for "you need to build the Hall of Congress." This is pretty much the most expensive building in the game, and before now it hasn't really done anything for you. Now it unlocks Federations. Because of this requirement, only United Earth and LIS can make or join Federations, but Reptilians and Zolarg will be getting their own equivalent buildings in 0.76.0. The only thing you can do with Federations right now is either make one, or join one. Making one is expensive, and joining one is free. However, when you choose to join a Federation, current federation members receive a ballot in their Federation screen and must vote to approve your membership. Balloting works like this. When a new measure is put up, it will expire in three days. At the end of three days, the yays and nays are counted, and the winner is determined. However, if a measure receives yays (or nays) from over 50% of current Federation members before the three days are up, the vote is also ended. The balloting system only works for admitting members right now, but it is going to be greatly expanded. Unlike Commonwealths, Federations are an "alliance of equals", with each independent member state getting 1 vote. One colony will be the president, voted on by the other members. The President will be able to put new initiatives up to a vote, and only the president can put a new initiative up, unless that initiative is a vote of no-confidence in the President, which could be needed if the current president goes inactive. Federations are going to be able to do things that regular colonies cannot do and, for those who wish to enable it, there is going to be an optional PVP element coming for Federations making use of Star Ships. I am not talking about attacking peoples bases or anything, but you might be able to send your fleet to blockade a planet, disrupt communications, etc. I am welcome to ideas on it, but this element will be 100% optional, and you can only do the PVP mode with Federation members who have enabled it. I want people to still be able to play a 100% peaceful mode if they wish. 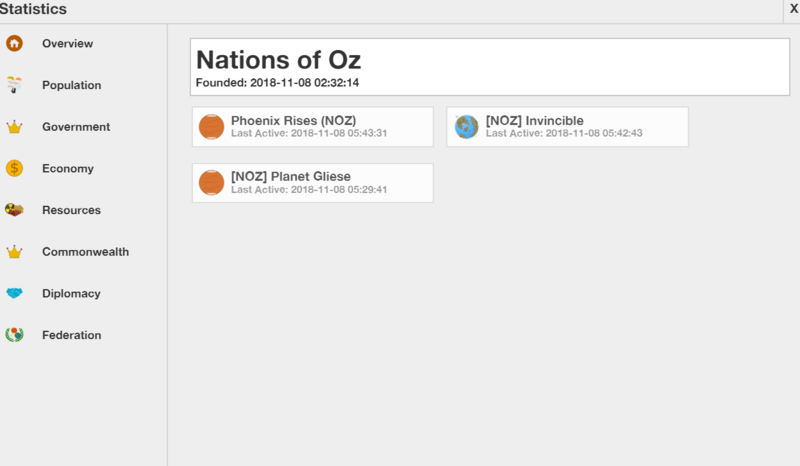 The Federations are in the early stages, but there will be new Federation stuff with each update, so feel free to start one up and start accepting members, so you are ready for when the fun stuff goes live. So those are the primary new things in this update, I am sure there are others, but I don't remember off the top of my head. Now I just want to give a quick update on what is coming next. As I mentioned, Federations are going to be fleshed out over the next few updates. In addition, both Federations and non-federation planets will be able to establish Trade Routes using their Star Ships, and the Colonial Map from the my-colony.com website is going to be accessible in-game soon to aid in this. There are also new interactions coming for Embassies, some of which will only be available to PVP Federations. To support this, both Zolarg and Reptilians are getting new giant 'Hall of Congress' type building soon, as well as Star Ship production. Finally, in-game moderators are on the way. I have several applications, and will be contacting people with offers as soon as the server is ready for them. There is still a bit of server work I need to do to accommodate what I want to do with moderation, but I think when it's all implemented, it will make the online experience a lot better for everybody. So that is all for this update. This one took me longer than normal to put together, and I have to spend the next few days catching up on other projects, but I should start v0.76.0 mid next-week. Until then, enjoy the update, and it should be hitting all platforms within the coming days! I think starship production is too early for the Zolargs, after all, they just figured out how to make a wheel. I was wondering about the Feds, is there a way to actually invite people into it or is it just that somebody sees it? Also will there be like a charter or a list that shows available Feds? dfv123 said:I was wondering about the Feds, is there a way to actually invite people into it or is it just that somebody sees it? Also will there be like a charter or a list that shows available Feds? Currently it seems to be that only people with a hall of congress can see the federation tab in the policy menu at all, so people with only, say, a capitol level 6 can't join through the join federation button. Is that intentional? 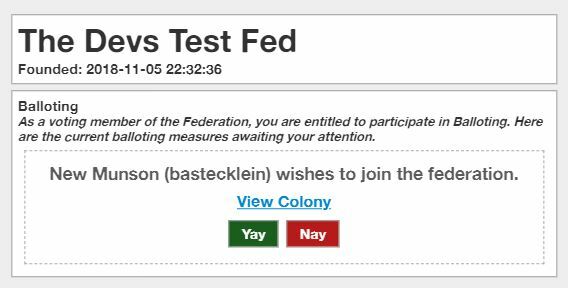 Vyryn said:Currently it seems to be that only people with a hall of congress can see the federation tab in the policy menu at all, so people with only, say, a capitol level 6 can't join through the join federation button. Is that intentional?